The ancient art of writing has a strong therapeutic effect. The only handwritten copy of the Constitution of the Russian Federation in Russia was presented at the International Exhibition of Calligraphy. It was unfolded in the Repin State Academic Institute of Painting, Sculpture, and Architecture of St. Petersburg, informally known as the St. Petersburg Academy of Arts. As the organizers determined, it was made to revive the forgotten art of calligraphy in Russia, to make it widely available, and to create conditions for its development, Vesti TV-channel reports. The total number of exhibits exceeds 350 works by the elite representatives of a variety of calligraphy schools from 24 countries. 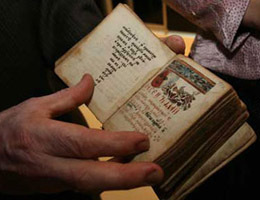 Among them are the most fascinating, yet unexplored, samples of Slavic writing, historical manuscripts of the peoples of the world, rare letters and documents, belonging to the Romanovs, the noble family of Russia. The visitors will also see a great gallery of rare, scarce and unseen manuscripts and miniature books from private collections and distinct samples of applied calligraphy. The exclusive neat handwritten copy of the Constitution of the Russian Federation is executed by a top-flight team of calligraphers in collaboration with publishers. The outstanding work is considered to be a symbol of Russia’s rebirth and its statehood, a huge milestone in the domestic book publishing industry. Calligraphy is compared to music for the eyes and medicine for the soul. Apparently, the ancient art of writing has a strong therapeutic effect. Vesti-Peterburg, tv-channel reports. Paper and parchment, quill and brush, colours and ink: there is no limit to what fantasy can create. Calligraphy is not only beautiful writing. Calligraphy masters create complete paintings where each of the symbol brings it own sense. Moreover, the art of calligraphy is available for everyone. Master-classes will also be held for several days within the exhibition. The exhibition project was supported by the Presidential Administration of Russia, the Ministry of Culture of the Russian Federation, the Government of Saint-Petersburg, leading scientific organizations, libraries and museums of the country, the World Club of Petersburgers, — ITAR-TASS, news agency reports. Fixed dates: September 16th – 21st.